The government decided Monday that it would pay $20 million to the families of nine Turks killed on the Mavi Maramara in 2010. 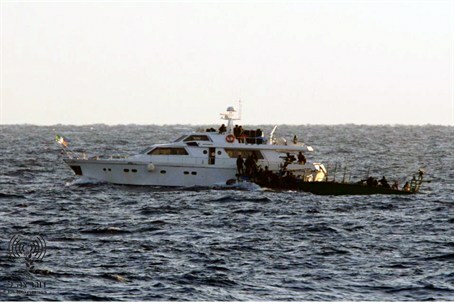 The Marmara was part of the Gaza flotilla that attempted to pass through an Israeli naval blockade of Gaza. The Turks, members of Islamist groups that supported Hamas, were killed after they attacked IDF soldiers who boarded the Marmara, in accordance with international maritime law. The Turkish terror supporters set upon the soldiers with clubs and axes, intending to kill them. IDF soldiers did not respond immediately, not realizing that they had walked into a trap when they boarded the ships. In return for the compensation, Turkey will agree to drop charges in its own courts against the IDF soldiers who participated in the raid on the Marmara. Turkey had threatened to try them for murder in its own courts, and to bring charges against them in the World Court. In addition, Turkey will drop its objections to raising Israel's status in NATO, Channel Two said. The report said that the $20 million was a high figure, but it was significantly less han the sum Turkey had demanded when negotiations began. Initially Turkey reportedly demanded $30 million in compensation, while Israel said it wouldn't pay more than $15 million. Netanyahu later conceded, raising the offer to $20 million, with an additional $3 million possible "if necessary to secure an agreement." The deal has not yet been finalized by both governments, although approval was expected. Meanwhile security sources revealed last December that Turkey has replaced Iran as the lead sponsor of Hamas, funneling up to $250 million a year to the terrorist organization that has threatened Israel with another intifada terror war and genocide. Last July, Turkey’s Deputy Prime Minister Bulent Arinc said his country would not be satisfied with Israel simply paying compensation to the families of the Marmara terrorists; he insisted Israel must acknowledge that the money it is paying is a result of its committing a "wrongful act." One of the flotilla participants who is set to receive compensation from Israel pledged last April to give all the money to Hamas and Islamic Jihad, two Iranian-backed terrorist groups.